Saturday afternoon, and the season’s begun. Down at the Jubilee Pool, in a match between the two county champion teams, we’ve had the better of Devonport. The score? 13-5. Slaughtered them, you might say. It was a chilly day, breezy – but still a good crowd out. Smith and Williams scored seven between them. And then there was the swimming. The chairman, Mr Jelbert presented the prizes: Lameston bagged the men’s 100 yards, and Anne Hyde the women’s. Someone to watch out for, a star of tomorrow? That would be young Perkins, won the under-14 diving and the 50 yards. Penzance – water polo champions of Cornwall again for sure this year. If we can beat Devonport Royals, we’re a match for anyone. We’re all set for their Navy Barracks team on Friday – come one, come all, we say to Devonport – and there’s more swimming and polo on Thursday by way of a warm-up. I can safely say that we anticipate no problems there, at least on the water polo front. Of course they’ve got a bit of an unfair advantage with the swimming, the Barracks team, being matelots and all. But it’s not just down at the Pool we’re in winning form. 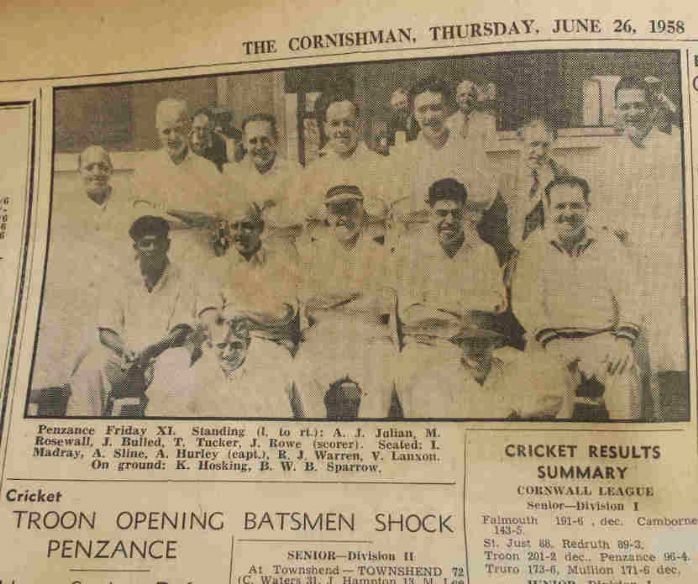 Yes, the cricket team had some stiff opposition at Troon, where the two opening batsmen declared at 201 runs, but our men eventually forced a draw and we’re still only just behind Camborne at the top of the league. You might say that three men out lbw is three too many, but the coach’ll be onto the men, no doubt with a spot of drill concentrating on getting their legs under control, and I’m sure we won’t see too much more of that particular problem for the rest of the season. The team’ll be at their best in a fortnight, when they meet Hayle. The Penzance Water Polo team did beat the Barracks 10-1, but as anticipated above the visiting team trounced them at swimming and so had the higher overall score by just one point. A fortnight after their disappointment at Troon, Penzance cricket team easily beat Hayle and caught up with Camborne at the top of the League. We apologise that – as may already be apparent – the author is handicapped by a severely limited knowledge of the sports concerned (or indeed any other sports). Corrections and further insights are, as always, welcome – any interesting new information will be added for next year.